I’ve been having trouble fixing the “macOS needs to repair your library” loop for the past couple of days and I’m running out of options. The message pops up over and over again, no matter what I do. I’ve gone as far as typing a command in Terminal (recovery mode) which Apple support sent me (the diskutil resetuserpermissions, except longer). I found some other commands online but I’m not sure what they do and that’s why I haven’t tried them, can anybody help me? This last one the user said I should get it by running id -u for user and id -g for groups, but as I am not the tiniest bit familiar with programming, I wonder if he meant I should replace “user” for id -u and same thing for groups?? Please help as I am desperate and Apple support’s solutions haven’t helped me so far!! That’s the link that should help. Worked for me. I’d been frustrated by this problem for weeks. Disk utility repair was not good enough. But resetting user permissions as per above link did the trick. Not the answer you're looking for? 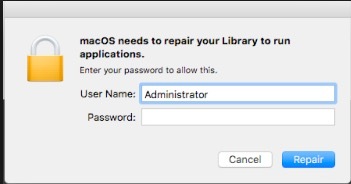 Browse other questions tagged macos upgrade permission error library . How to repair ~/Library permissions?